It's Memorial Day as I write this and as a veteran, I just wanted to remind you, Dear Readers, to remember those who have given their lives for our nation today. Don't thank me; don't thank the vets who are alive...we have our day. Today is the time to honor our fallen. From those who fell at Lexington and Concord to the fields of Gettysburg to the World Wars, Korea, Vietnam, The Gulf War, and those we fight today, it is a time to honor them and their sacrifice to our nation. As you gather with friends and fire up the grill, (I like my steaks well done, thank you) please remember that there are families grieving losses and missing loved ones today. Rick Nichols, creator of the enigmatic John Logan featured ...in a series of thrillers from Pro Se Productions, brings to life another character from his fervent imagination. 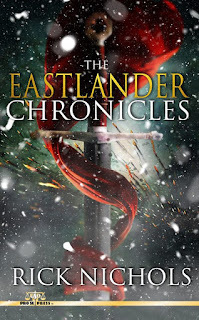 Harkening back to a wilder world and when justice was meted out by the blade, Nichols and Pro Se Productions proudly announce the release of THE EASTLANDER CHRONICLES.